This article is about ALEC's Energy, Environment, and Agriculture Task Force. Corporations can join this task force for $3,000 a year. For model legislation crafted and adopted by the Energy, Environment, and Agriculture Task Force, go here. For task force directories and meeting agendas, go here. "Energy Savings Performance Contracting: A Self-Funding Source of Money that Creates Jobs"
"State and Federal Subsidies for Electric Vehicles"
"Clean Power Plan: What it Means for Utilities and States"
"Avoiding Premature Implementations: MATS, the Clean Power Plan and Utilities"
"The Case for Mutual Assistance 'State Operating Authority' in Support of Electric Power Restoration"
"The Value of Utility Scale Solar"
"Assembly Bill 32: The California Case Study"
"Consumer Protection Concerns Surround Rooftop Solar"
"A Comprehensive View of Restrictions on Hydraulic Fracturing"
"The Encroachment of Transportation Fuel Mandates"
"EPA's Clean Power Plan - Strategies for States"
"Natural Gas Transmission and Transportation Pipelines"
"National Ambient Air Quality Standards (NAAQS) for Ozone"
"The Implications of the Proposed 'Waters of the U.S.' Rule on the Energy Industry"
"Current State of Transmission Pipeline System"
"Nongovernmental International Panel on Climate Change (NIPCC) Update"
"Liquified Natural Gas (LNG) Exports"
"Property Assessed Clean Energy (PACE) Programs"
"Sue and Settle - How Federal Agencies Replace States with Environmental Groups"
"EPA Approached to Regulating Greenhouse Gas Emissions under the Clean Air Act"
"Strategies Employed by States to Address Proposed Emissions Regulations"
"The Implications of New Clean Water Act (CWA) Proposed Regulations on Agriculture"
"EPA Approaches to Regulate Carbon Dioxide Emissions from Power Plants"
"Natural Gas as a Motor Fuel"
"Alarmism and the Science of Chemical Risk"
"EPA's Adversarial Oversight of States' Regulatory Regimes for "Fracking," and What It Means for the Future"
"Gauging Interest for Future Natural Gas, Hydraulic Fracturing, and Pipeline Symposium"
The task force also planned an "EPA Strategy Session" featuring a "discussion of strategies legislative and private sector members can employ to address EPA's rulemaking to limit greenhouse gas emissions from new and existing power plants." "Resolution in Opposition to a Carbon Tax"
"Resolution in Support of Electric Power Grid Modernization Principles"
"Pre-emption of Local Agriculture Laws Act"
"Nuclear Energy’s Continuing Role in Providing Baseload Electricity," presenter not yet determined as of July 2013. The Energy Subcommittee discussed the "Resolution in Support of Electric Power Grid Modernization Principles," the "Market-Power Renewables Act," and the "Renewable Energy Credits Act." There was a presentation on "LNG exports: A Story of American Innovation and Economic Opportunity" by Jason French of Cheniere Energy. The Agriculture Subcommittee discussed the "Pre-emption of Local Agriculture Laws Act." There were presentations on "Pollinators and Crop Protection: Working Together to Improve Bee Health and Minimize Risks" by Elsa Zisook, formerly of Valent and Monsanto, and "Labeling of Genetically Engineered Foods" by person or persons yet to be determined as of July 2013. The Environmental Health and Regulation Subcommittee discussed the "Resolution in Opposition to a Carbon TaxExtended Producer Responsibility: Costly government mandates on manufacturers for what result?" by Kevin Canan of The Product Management Alliance. "Resolution in Support of the Keystone XL Pipeline" (This proposal seeks to "support continued and increased development and delivery of oil derived from North American oil reserves to American refineries, urge Congress to support that continued and increased development and delivery, and urge Congress to ask the U.S. Secretary of State to approve the Keystone XL pipeline project that has been awaiting a presidential permit since 2008 to reduce dependence on unstable governments, improve our national security, and strengthen ties with an important ally." According to the 2011 Annual Meeting Program, the meeting featured "talks on a variety of topics, including climate science, chemical bans, and barriers to investment in the oil and gas industry. The Task Force will consider three pieces of model legislation, which deal respectively with intrastate coal production, preservation of the right to hunt and fish, and EPA regulation and energy affordability." Panel discussions hosted by the Energy, Environment and Agriculture Task Force during the meeting included: "Benefit Analysis of CO2" and "A Smarter Approach to Improving our Environment: Addressing the Costs of Proposed EPA Regulations on Energy Affordability." Proposed new model legislation included the "ALEC Resolution in Support of Energy Security, Production, Distribution, Environmental Protection and Economic Growth in the United States." Brownstein Hyatt Farber Schreck is a corporate law firm with offices in Albuquerque, Denver, Las Vegas, Los Angeles, Orange County, Phoenix, Reno, Sacramento, San Diego, Santa Barbara, Santa Fe and Washington D.C. In 2010, Open Secrets shows that the firm's PAC raised $329,335 and spent $157,239 on House and Senate politicians. Individual donors, mostly employees, gave $160,879 to the PAC. The American Gas Association is a coalition that represents natural gas-- or "fracking"-- companies. AGA has 501(c)(3) status and actively lobbies for pro-drillings legislation in state and federal government. "Fracking"-- or hydraulic fracturing, for natural gas has been linked to polluting the wells of the people living near drill sites. The AGA PAC spent a total of $435,142 in political contributions in 2010. Nick Surgey, Revealed: ALEC's 2014 Attacks on the Environment, PRWatch, April 23, 2014. Brendan Fischer, Dirty Hands: 77 ALEC Bills in 2013 Advance a Big Oil, Big Ag Agenda, PRWatch, August 1, 2013. ↑ American Legislative Exchange Council, 35 Day Mailing-- Agendas and Proposed Policies for 2015 States and Nation Policy Summit, organizational document, accessed on November 11, 2015. ↑ American Legislative Exchange Council, 35 Day Mailing-- Agendas and Proposed Policies for 2015 Annual Meeting, organizational document, June 18, 2015. ↑ 5.0 5.1 American Legislative Exchange Council, 35 Day Mailing-- Agendas and Proposed Policies for 2015 Spring Task Force Summit, organizational meeting, April 10, 2015. ↑ American Legislative Exchange Council, 35-Day Mailing — States & Nation Policy Summit, organizational document, October 30, 2014. 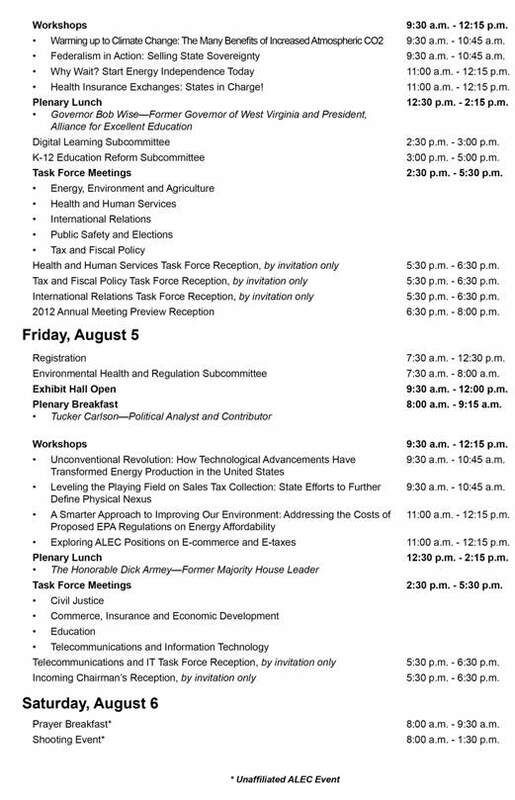 ↑ 7.0 7.1 American Legislative Exchange Council, 35 Day Mailing-- Agendas and Proposed Policies for 2014 Annual Meeting, organizational document, June 25, 2014. ↑ 8.0 8.1 American Legislative Exchange Council, 35 Day Mailing-- Agendas and Proposed Policies for 2014 Spring Task Force Summit, organizational document, March 28, 2014. ↑ 9.0 9.1 9.2 9.3 American Legislative Exchange Council, 35-Day Mailing — States & Nation Policy Summit, organizational document, October 30, 2013. ↑ American Legislative Exchange Council, Model Policies Annual Meeting 2013, organizational website, accessed October 2013. ↑ 11.00 11.01 11.02 11.03 11.04 11.05 11.06 11.07 11.08 11.09 11.10 11.11 11.12 11.13 11.14 11.15 11.16 11.17 11.18 American Legislative Exchange Council, ENERGY, ENVIRONMENT AND AGRICULTURE TASK FORCE 35-Day Mailing - 2013 Annual Meeting, organizational document, July 3, 2013, on file with CMD. ↑ Elsa Zisook, Elsa Zisook, LinkedIn.com profile, accessed October 2013. ↑ ALEC,Energy, Environment and Agriculture Task Force Memorandum Organizational Document, October 27, 2011. 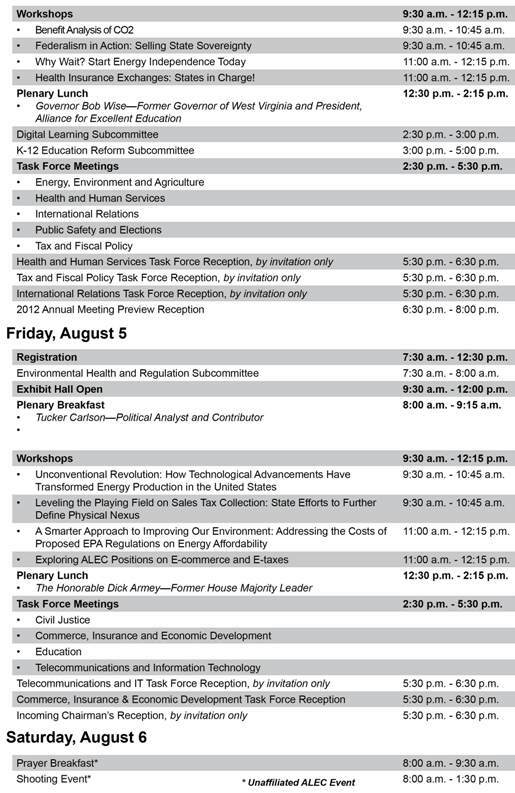 ↑ ALEC,Energy, Environment and Agriculture Task Force Memorandum Organizational Document, June 30, 2011. ↑ ALEC State Legislators Push Back EPA’s Onslaught of Regulations: ALEC’S EPA Regulatory Train Wreck proving to be successful, Accessed April 18, 2012. ↑ 19.0 19.1 19.2 19.3 19.4 American Legislative Exchange Council, 2014 Annual Meeting 35-Day Mailing, organizational agenda document, accessed July 2014. ↑ 22.0 22.1 22.2 American Legislative Exchange Council, Energy, Environment, and Agriculture, organizational website, accessed October 2013. ↑ American Legislative Exchange Council Energy, Environment and Agriculture Task Force, organization website, accessed May 26, 2011 this page has been altered by ALEC and is no longer available.